Mobile World Congress is the largest tech show dedicated to wireless technologies held in beautiful Barcelona, but while previously it could brag with having a huge and awesome Android booth with slides and smoothie bars (frozen yogurt! ), and all fun things about Google’s platform, this year the show will do without an Android booth. 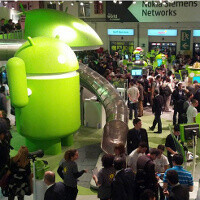 Google France has confirmed that in 2013, Android will not have an official spot at MWC. Members of the team however will still be at MWC to support Android’s partners. “I can confirm that indeed [...] we will not have a booth at MWC this year. However, the Android team will be present in Barcelona to support its partners”. We don’t know why Google chose to skip the show, but we do hope to see a strong showing from Android’s partners nonetheless. ...doesn't mean there won't be any new Android devices, no? ...irrespective of the make. They don't need to, the show would be full with Android devices from different OEMs anyway. They'd have their own spotlight on May 15. Thoughts of the Chrome Android statue at Google HQ come to mind, they pulling a fast one with a play on words? IMHO they simply don't want to steal attention from their partners... they know they're in a delicate position. It doesn't really surprise me that Google won't be there, mainly because they, like Apple, have their own "trade show". We don't see Apple there, my guess is mainly because they have WWDC, so why should Google be there because they have I/O. I'm fairly sure that Motorola will be there though, so technically Google will be there.